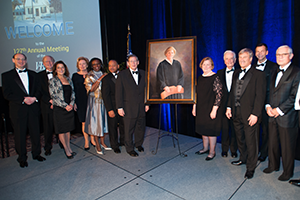 During its annual meeting in January, the Virginia Bar Association unveiled a portrait of former Virginia Supreme Court Justice Jane Marum Roush. The VBA has a longstanding tradition of commissioning portraits of the state’s top judges. All current members of the court attended the unveiling ceremony. The painting will hang in the Supreme Court of Virginia in Richmond. The unveiling was a dignified endnote to a political saga that made headlines throughout the 2016 General Assembly session. Roush was a Fairfax Circuit Court judge for more than two decades. Her service on the Supreme Court, however, was brief, about seven months, because of a political tug of war between two branches of state government. Her appointment exposed the depth of an ongoing feud between Gov. Terry McAuliffe and the General Assembly’s Republican leaders. The bickering alarmed the public and the legal community. Twenty-seven former VBA presidents, in fact, signed a letter urging the governor and the GOP legislative leaders to resolve their quarrel. The lawyers worried that a fracas would cause many well-qualified attorneys to reject offers to become judges. While judges are elected in many states, the General Assembly makes all judicial appointments in Virginia. The dust-up began when McAuliffe appointed Roush to the state’s high court in July 2015 when the General Assembly was not in session. Virginia governors can make interim judicial appointments that last until the next legislative session. In the vast majority of cases, the General Assembly has approved the governor’s choice for a permanent term, but not this time. Republicans did not question Roush’s qualifications but wanted her off the court because McAuliffe had not consulted them before choosing her. In a series of false starts and aborted political maneuvers, the legislature eventually replaced Roush in March 2016 with Stephen R. McCullough, formerly a judge on the state Court of Appeals. Roush now works with The McCammon Group, a Richmond-based firm that employs many former judges in mediation and arbitration.